I want to pick up my online order in person. How do I select that option? At check out, you will be asked to type in your address. As soon as you type in your Texas residence the option for “In-Store Pick-Up” will be available. No. We will include the PACKING SLIP which only notates the customer name, print requests and shipping address. If you would like to send your receiver a special note, just type it in the box at checkout. Why don’t I see the right size after I uploaded my image? Based on the file you upload, our site generate suggested options. Rounded to the nearest whole number, your file must be sized corresponding to your desired print size. If you upload a low quality/low resolution file, you will be given less options. We suggest uploading at 150-300 dpi, saved as .jpg, and size the image by width and height in inches with no added borders. You will not be able to crop or edit your photo once it is uploaded. I need my print right NOW! Can I rush it? Yes, Skyline now offers a rush option. The rush option pushes your order to the front of the list, making it a priority. Rush orders accrue a fee of 25% of your total. RUSH SCANS are an additional $40.00 a piece. Prices vary depending on size. How do I find Skyline? Skyline Printing is located at 4120 Commercial Center Drive #100, Austin, TX 78744. We are located in a warehouse district on the corner of South Industrial and Commercial Center Drive. Our logo will be on the front door. While Skyline endeavors to complete all orders within 5 business days, wait times may be extended depending on the content of your order and during busier periods (September - December). Visit our shipping page for more info. There is always the option to rush your print for a 25% fee of your total. I am worried about the color of my prints coming out too dark or too light? Can I proof first? The proofing process exists due to differing color profiles and screen calibrations. Please understand that what you see on your screen can differ from what gets printed. We print Adobe RGB and edit images at 65-75% screen brightness. To order proofs, please email the request (along with the hi-res files if they have not been uploaded to your account already) to orders@skylineartprints.com and we will enter an order for you manually. We provide around 8"x10" proofs on our Epson Photo Matte paper for $5 each. We will create and email you an invoice for your approval and you can then call us with payment info (we do not have access to your payment info you provided to the site...sorry about that). Can I only order frames? How do I hang a Double Panel Acrylic with Standoffs? Click here to download a handy PDF instructional. Please refer to shipping and returns page. 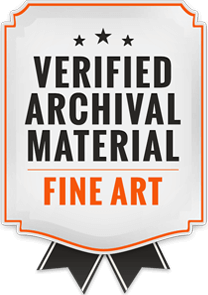 Depending on what your order consists of, we will put rolled paper and canvas in secure shipping tubes, while stretched canvas and framed pieces are protected with cardboard corners, bubble wrap, craft paper, and a secure shipping box. We use a 2 mil clear plexi-glass. It is ideal for safe shipping and blocks 66% of harmful UV light. Color will remain consistent over all of our media types (except metal prints due to sublimation process). What are the papers really like? Can you describe them to me. Please visit our print media page for detailed descriptions of our media types. If you would like more info, feel free to come into our store front to see the substrates in person. Not local? Email us at orders@skylineartprints.com to request a sample packet to be mailed directly to you. Can I print bigger than what the website says? Can you mount to foam core? We stock only white mattes. We will always coat canvas for protection, stretched or loose canvas. We have a glossy and satin option for your preference. Can I add texture to my canvas print? Yes, we texture in studio with a clear medium. Can my paper prints be deckled? Yes, we can deckle for a fee of $3-5 per print.